The CWC meeting is being held in Gujarat after 58 years, it was held in the state of Bhavnagar in 1961 and the party has chosen March 12, the anniversary of the Salt March for the meeting. Mahatma Gandhi had begun the Salt March from Ahmedabad on March 12, 1930. The Congress is expecting a crowd of over three lakh people in the home turf of Modi and BJP president Shah ahead of the Lok Sabha polls, a party leader said. 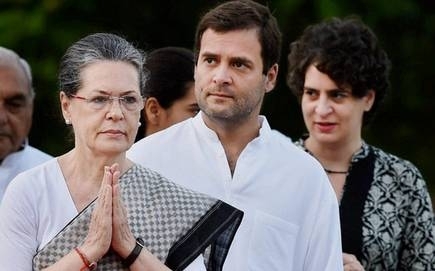 The Congress Working Committee (CWC) meeting will be held at Gandhinagar in Gujarat on Tuesday to discuss the upcoming Lok Sabha polls. The meeting would be followed by a mega rally at Adalaj town in Gandhinagar where Congress General Secretary Priyanka Gandhi Vadra is likely to address her first public rally after entering politics. After the meeting at the Sardar Patel memorial building, senior Congress leaders, including Rahul Gandhi, UPC chairperson Sonia Gandhi and former prime minister Manmohan Singh, as well as current and former party chief ministers will attend the 'Jan Sankalp' rally', state party unit chief Amit Chavda said. Before the CWC meet, senior party leaders will visit the Gandhi Ashram to attend a prayer meeting. The leaders will pay tributes to Mahatma Gandhi as March 12 marks the launch of the historic Dandi March by him from the Sabarmati Ashram here in 1930. Besides, 2019 is also being celebrated as the 150th birth anniversary year of the Father of the Nation. This will be Rahul Gandhi's second visit to Gujarat within a month in the run-up to the polls. He earlier addressed a rally in Valsad district February 14.